Gator Paper has another great bag in its line of products! 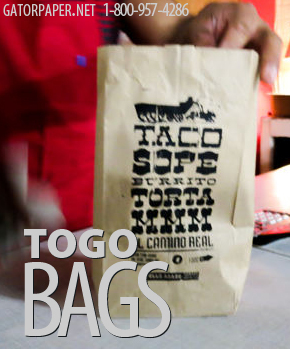 The Custom Printed To Go Bags are perfect for fast food restaurants, coffee shops, market delis, special events, movie theatres, gift shops and more. Gator Paper provides To Go bags in white, Kraft paper and multiple color. With our color printing technology we can add any logo to your bags for added brand recognition. These bags are better than any other paper bag on the market! We offer the bags in multiple sizes: from 1# to 25# and 1/6 barrel grocery bags. We are sure to have the size you need. The Gator Paper website displays all products available in their food packaging product line. *** Anything your business might need, from custom printed plastic cups, hot paper, cushion foil paper, Kraft paper, to beverage napkins, candy bags, to go bags, to go boxes, sandwich bags and more. We have everything to make your food service preparation a success! Have questions? Speak with one of our friendly customer service representatives to answer any questions and modify any order to make sure you get exactly what you need for your business. We offer the bags in multiple sizes: from 1# to 25# and 1/6 barrel grocery bags. Brand your bags for all of your customers! Also read about the custom printing technology available to most all our products. Gator Paper’s top of the line printing technology allows any logo to be printed on to the products for added style and brand recognition. Even if you have a custom color, our customer service representative can review the color and match it to our color pallet. Gator Paper works with each customer to ensure the order you receive is exactly to specification.